it is a personal response to Mathematics by the artist. Each year in January, thousands of Mathematicians gather at the Joint Mathematics Meeting (JMM) to discuss current issues in their field. 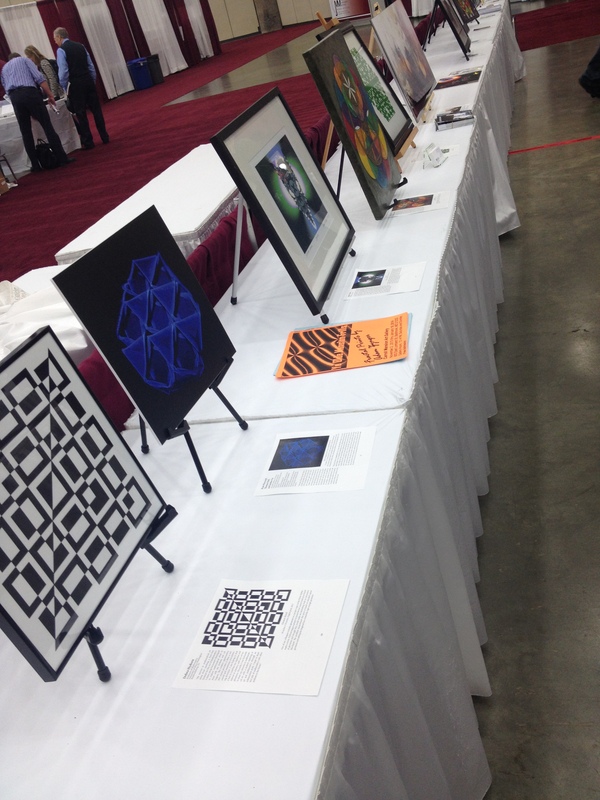 For the past 11 years, an exhibition of Mathematical Art has been part of the event. This year the Joint Meeting was held in Baltimore at the convention center. The art exhibition was held at one side of the general exhibition hall. I have participated in the exhibition five times in the past six years and over that time the exhibition has matured, both in the range of work exhibited, and in the quantity of interesting – or even exciting – work. Exhibitions like this are really a mixed bag of prints, drawings, paintings and sculpture of all types. You can find full catalogs of the shows online. here I will discuss just a few of my favorites from this year’s show. Kolam-93X93 is a painting on canvas based on the fractal patterns of Kolam drawings. Shanthi Chadrasekar has incorporated the rules of Indian Kolam drawings into her artistic practice. Kolam drawings are traditionally drawn by women, each day, at the entrance of their homes. In this painting, Chandrasekar has created an elaborate 93 by 93 dot grid with a single thread-like line that gracefully winds around each dot, completely enclosing the dots in a web. I find the intricacy of this painting mesmerizing. Spending a few moments with this work, the viewer feels as though they too could be encircled by this unbroken thread. 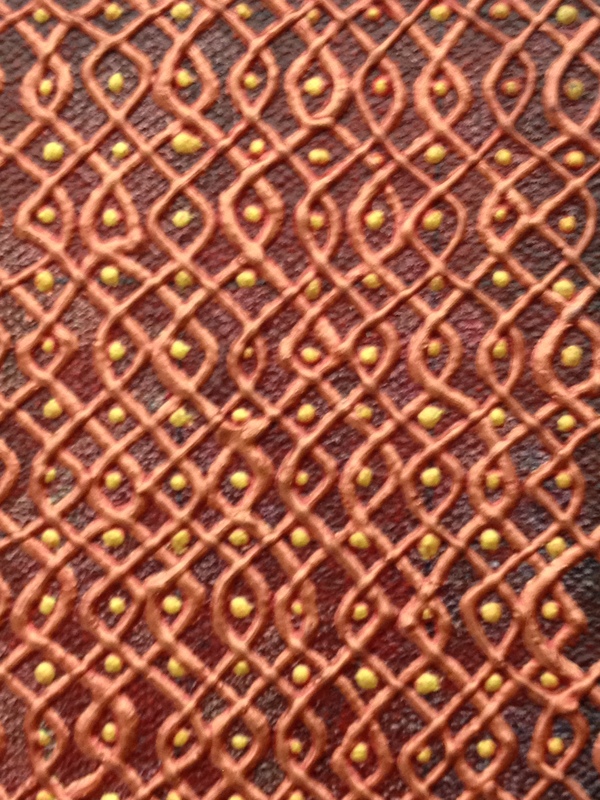 The patterning on this painting is so dense that a small image of the entire piece will not do justice to the work so I am providing just a close up of a small section. 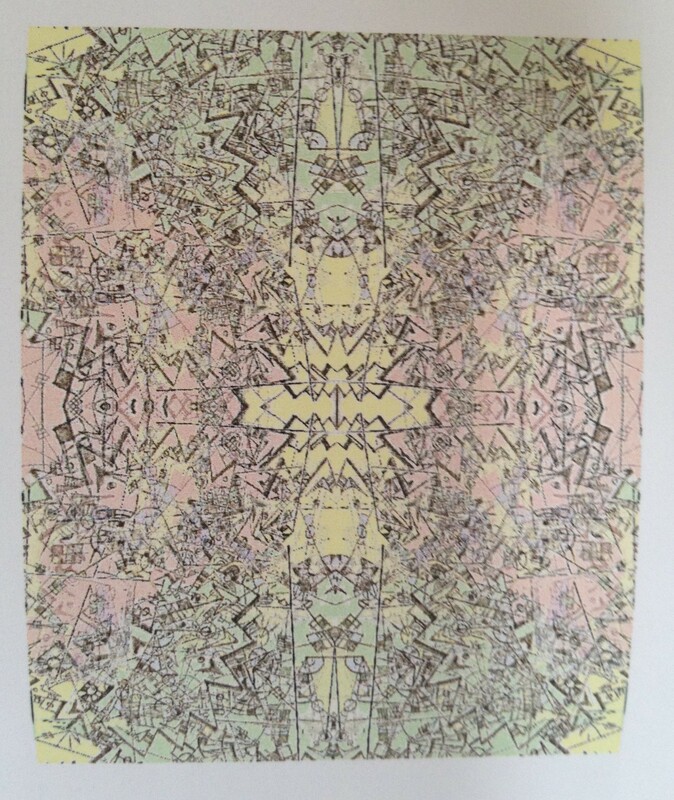 Karl Kattchee has developed a unique process to use Mathematics to create his digital prints. His work starts with hand drawn abstract drawings that are then multiplied and manipulated using a camera, a computer and a printer. He creates reflections, translations, etc. until the image appears to have fallen into chaos. Kattchee then builds patterns using these chaotic elements. What I find very interesting about these prints is that the whole process begins with what Kattchee refers to as” abstract automatic drawings”. The freedom of this stream-of-consciousness type of drawing lends a whimsical quality to the initial pictures. After they have been subjected to all of the technical process, they retain a playful quality: the drawings dance across the page. More about the art exhibition at JMM in Baltimore next time.